The following is a guest post by Starr Osborne, author of Home Staging That Works: Sell Your Home in Less Time for More Money (AMACOM 2010), on staging your home to sell. It’s a difficult time for anyone to say goodbye to their home. It’s not just packing boxes, but also packing up memories in order to start over and allow someone new to build their own memories in that home. There are so many problems and solutions when staging your home to sell that people aren’t quite sure where to start. Here are some of my top tips to make sure you’ve got the basics down and are well on your way to putting forward the best home possible. 1. In this market, it is wise to get a preinspection. Based on the results of your preinspection, schedule appointments with reputable vendors to get professional estimates on what repairing any major problems would cost. You and your buyers don’t want any surprises. 2. Identify the demographic of your most likely buyer. Keep them firmly in mind as you prepare to put your home up for sale. Is it a Gen Y couple looking to start a family or a recently divorced Baby Boomer looking to downgrade? 3. Buy new house or apartment numbers to replace your existing ones if they’re dated or damaged. It’s a little thing, but it’s one of the first that prospective buyers notice. 4. Buy a large, plain, neutral-colored doormat to replace each existing mat. A fresh start, a fresh step into a possible future home. 5. Spend twenty minutes in each room putting anything you want to give away into a pile in the middle of the floor. (Have a trash bag handy for things you are going to throw away.) Not only does this help you pack up, it helps you let go of the old house and de-clutter for the staging. 6. Pack up all photographs, mementos, and personal items that you can live without while your home is on the market. People want to imagine themselves in this home–and they can’t do that surrounded by reminders of the current owners. 7. In each room, pack two boxes of belongings—clothes, books, utensils, and so on—that your family can do without until your home sells. Focus on removing items from built-in bookshelves and from closets or built-in drawers that buyers will be opening. Buyers can and will open those drawers. 8. Put the small, personal items that your family will need (such as medications) into closed containers out of sight, so that buyers won’t see them. Ever snuck a look in someone else’s medicine cabinet? Do you want buyers doing the same to you? 9. Clean your home as thoroughly as possible. Get your windows cleaned. Don’t forget to clean your front door. Remember: Buyers standards are higher than your own. 10. Remake all beds with white sheets and pillowcases if you have them. A blank slate for people to imagine. 11. If you have a yard or garden, tidy it up: prune, weed, mulch, edge, and mow. Make sure no shrubs are blocking your windows or paths. You don’t have to have a high-maintenance garden, just a reasonably well-kept one. 12. Open the curtains or blinds. Sunlight sells. Nothing makes your home sparkle like natural light. I hope this helps get you started on staging your home to sell. 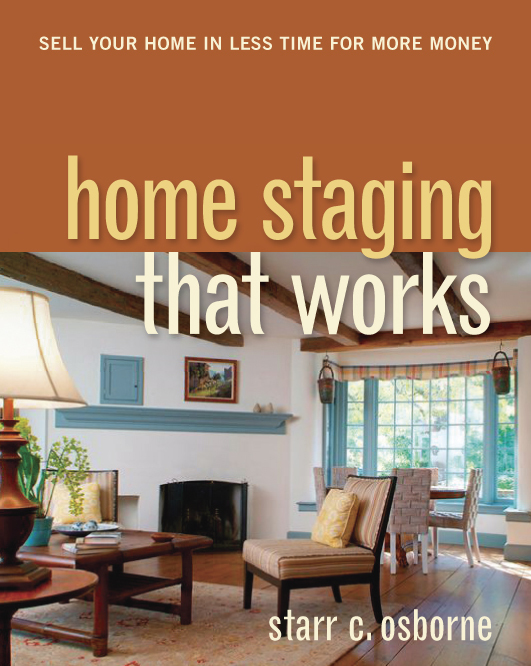 Learn more in my book, Home Staging That Works: Sell Your Home in Less Time for More Money (AMACOM 2010). Starr C. Osborne is the owner and founder of Tailored Transitions, Philadelphia’s premiere home staging, moving-management, and design company. 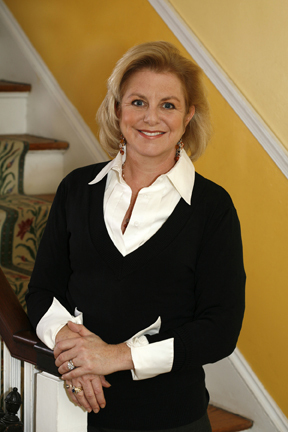 Their diverse work with realtors, developers, and private clients has included The Bank Building, Parc Rittenhouse, The Residences at Wood Norten, The Hill at Whitemarsh, Independence Seaport Museum, and Natural Lands Trust. Tailored Transitions has been featured in USA Today, The Real Estate Professional, Philadelphia Style Magazine, and The Philadelphia Inquirer. She lives in Philadelphia, PA.
Watch for Sid Davis’ guest post tomorrow on turning your home greener. This entry was posted in Author Guest Posts, Buying & Selling a Home in a Tough Market and tagged Real Estate. Bookmark the permalink. There’s a great tele-seminar about staging a home at http://www.socialmediamarketingforrealtors.com/staging … I listened to it last week. Good advice on Home Staging. This book is one of the only ones I haven’t had the opportunity to read yet. I will look for it in my local bookstore.